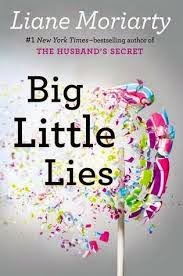 a book chick: "Big Little Lies"
my take: I was quite surprised by the almost flippant tone of the opening of this novel. It seemed light, superficial almost. Fluffy? Then each of the main characters began to reveal a bit of her real story. And then the easy breezy tone contrasted with the traumatic events in these women's lives and helped to soften the blows. There's a much pinned and posted saying something to the effect: Be nice to everybody because you don't know their struggle. This book proves the point. Behind the cattiness, the child bragging, the social posturing, lies the heart of the matter: the big and little lies told to survive. My bookies gave this book to me just before I headed to live in the Old World for a while. I started it on the plane could hardly put it down to sip on my wine. Great read!